One of my favorite things is bringing the joy of animals to others. It’s even more fun when my dog Callie gets to be involved. 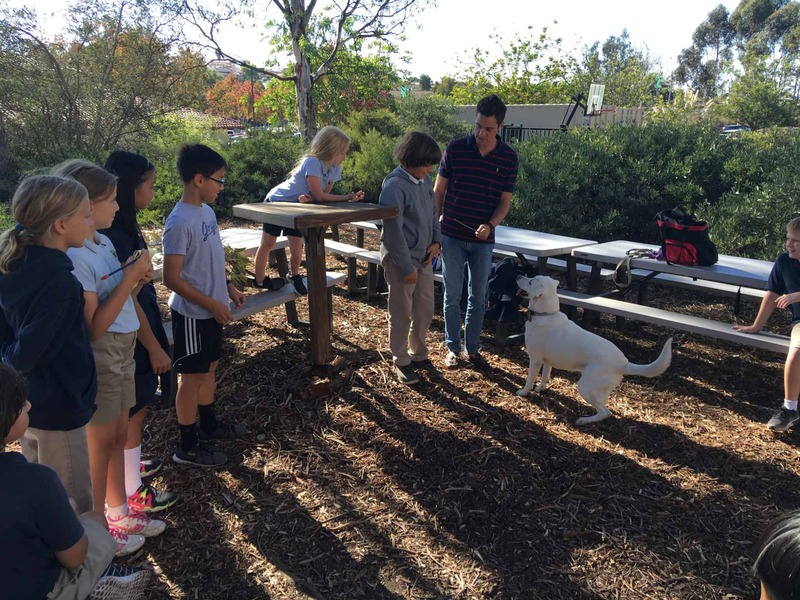 This week, Callie and I had the privilege of speaking with 4th, 5th, and 6th graders at The Cambridge School in San Diego on some of the most pressing issues facing both domestic and wild animals. These students provided incredible solutions and also restored some of my faith in our human population. As the adults of this world continue to pollute, destroy, and be misguided on animal issues, it’s nice to know that there is a new generation of animal advocates waiting in the wing. They are smart, savvy, and… 9-years old! Demonstrating positive reinforcement with Callie to the Cambridge students. The students at The Cambridge School are competing in First Lego League’s “Animal Allies Challenge,” a county-wide competition challenging middle school students to create products that solve an animal and human problem. “Get read. Get set. Roar! Or you could bark, quack, or squeak, because the 2016 ANIMAL ALLIES (SM) season is all about our furry, feathered, and finned friends. In the 2016 FIRST LEGO League Challenge, more than 28,000 teams of students age 9 to 16* will look into the eyes of our ANIMAL ALLIES. What might become possible when we learn to help each other? My job was to answer their questions, offer insight as an animal behaviorist, share training techniques, and guide them as they start to develop their products. Now, because this is a competition I won’t be sharing their products just yet. We’ll save that for another blog post. However, I can share some of the highlights from my visit as well as the categories that these young entrepreneurs are targeting. No surprise there. We started off with playtime. The kids threw sticks for Callie, asked her for some of her behaviors (“be a lady” was their favorite), and ran around… as kids and dogs do. This also gave me an opportunity to explain the basics of dog training as well as what goes into properly caring for a dog. Callie being very entertained by the middle schoolers. The kids were also very interested in my time working with exotic animals like sea lions and dolphins. We talked about the challenges that trainers face when caring for these incredible animals as well as the rewards that come when dedicating your life to the welfare of all animals. These kids were smart. I meet a lot of kids, and truly, these kids were not your average middle-schoolers. They were inquisitive, engaged, and most importantly, had a passion for animals and improving the lives of these animals. 6th Grader and Callie showcasing some of Callie’s behaviors. 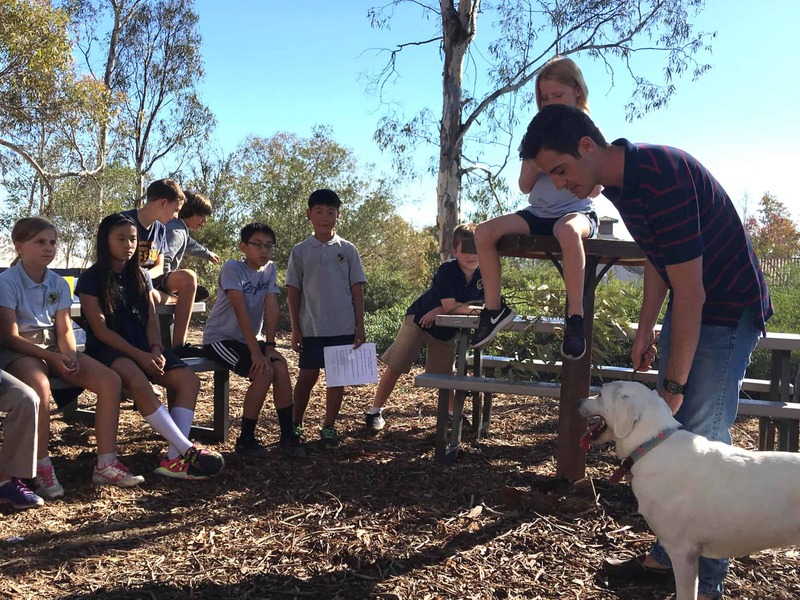 The middle schoolers were tasked with providing innovative solutions which help both animals and people. 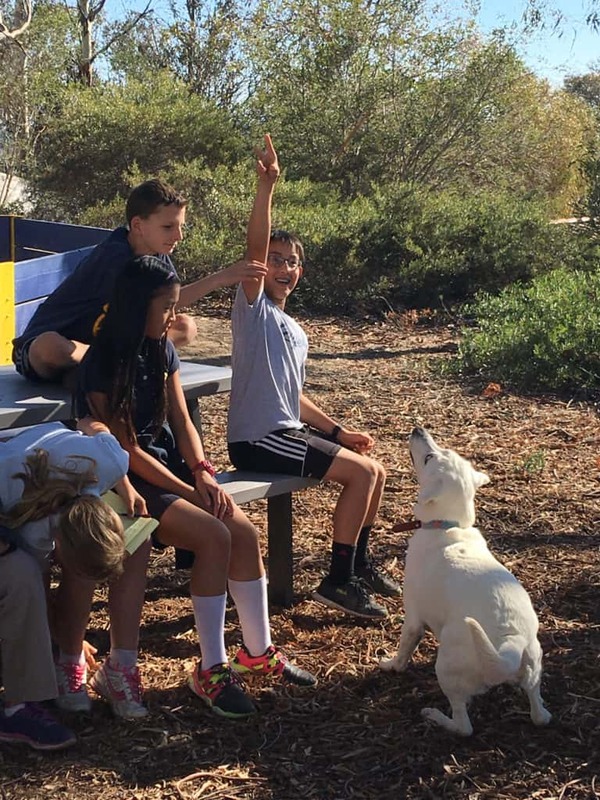 They focused most of their efforts on issues facing wild animals: the drought in California, lack of food, and the increasing problem of litter and pollution. Other students focused on issues facing pet owners: human and pet obesity and canine adoption. Their ideas aren’t just “good for a middle schooler.” They are good ideas! Period. I am very excited to see how their ideas develop into fully-functioning solutions and how far they get in the competition. I am often discouraged by the amount of misinformed people in our world when it comes to animal welfare and the future of our environment. It’s scary to think that personal and political agendas would outweigh (and are outweighing) the betterment of animals. These kids gave me hope that future generations will think logically when it comes to animal rights and animal welfare. The human race needs to stop making decisions that make us feel good at the detriment of animals. We need to put animals first, and these kids are doing just that. 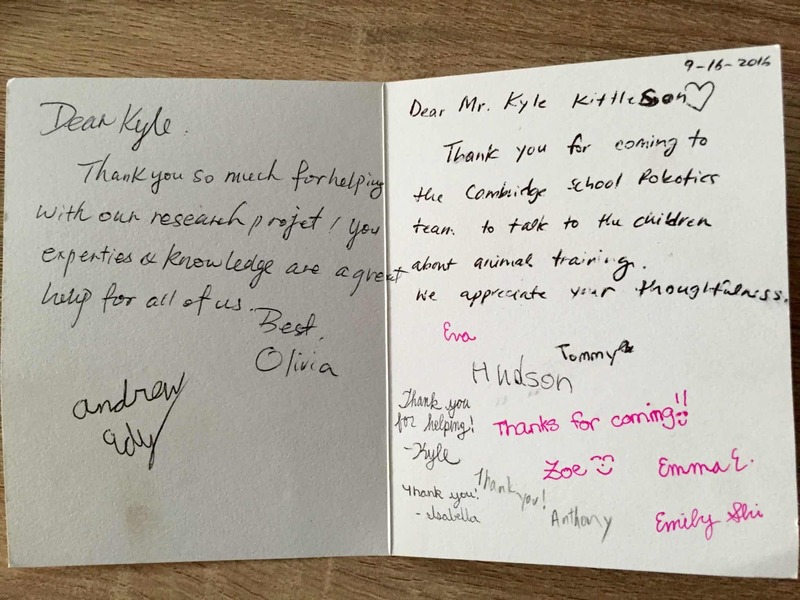 A thoughtful thank you card from the Cambridge students.